Whether or not you're interested in Amazon Connect for your contact center or Amazon Chime for your business communications, you've probably been following Amazon on its journey to find the best place to locate its second headquarters. It has pared the list down to 20 finalists, including a couple in the New York area and three around Washington, D.C. 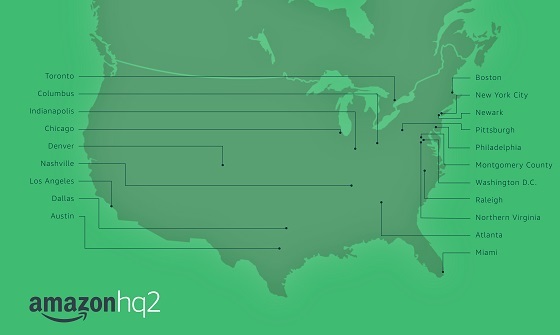 Here's my educated guess as to which location among the 20 on Amazon's "short list," shown in the Amazon HQ2 map below, will win the coveted award. 1. Locations with limited access to international business flights (Austin, Columbus, Denver, Indianapolis, Nashville, Pittsburgh, and Raleigh). This also serves as a proxy for relatively smaller metropolitan areas, with populations of around 3 million or lower. While the cost of living is better in a smaller area, the pool of high-tech workers is more limited than in larger metro areas (with the exception of Austin and Raleigh, which are tech hubs). In addition, smaller locations tend to offer fewer cultural activities and amenities. And while being a large fish in a small pond is nice, attracting and retaining talent may be more difficult in smaller locations than in larger ones. 2. Cities that aren't far enough east -- meaning, Los Angeles. Amazon already has a West Coast orientation, and 18 of the 20 finalists are in the Eastern or Midwestern regions. This is telling of Amazon's desire to look beyond the western half of the country. Otherwise, the San Francisco Bay area; San Diego; and Portland, Ore.; would likely have made the initial cut. 3. Cities that have publicly announced they won't provide financial incentives. This includes Toronto, which in many respects would be an ideal place for a second headquarters. While the cost of living there is high, Toronto would provide a good cultural fit and a more international perspective for Amazon -- familiar but different, forcing the company out of its U.S.-centric comfort zone. And after conquering e-tail in the U.S., Toronto would give Amazon a step up to conquering the world. 4. Cities/areas that aren't willing to provide at least $5 billion in incentives; money talks, and Amazon has a history of extracting financial incentives from government entities. According to Good Jobs First, a non-profit tracking state tax breaks, since 2005 Amazon has received $1.4 billion from nearly 100 communities. It would be hard to imagine that Amazon will forego billions of dollars of incentives when selecting the location for its second headquarters. This leaves two locations: Newark, in the New York area; and Montgomery County, in the D.C. area. And the winner will be, in my estimate, Montgomery County. While Newark offers strong positives, including an international airport that's also a United Airlines hub, access to New York City, and a large talent pool, it still has to overcome its less than stellar reputation. In the New York area, Amazon would be a big fish in a huge pond. And there is tremendous competition for top talent, especially given that New York is a financial, entertainment, fashion, and cultural hub. Working for Amazon in Newark just doesn't carry much cachet. In locating HQ2 in Montgomery County, Amazon would add hundreds of thousands of "mini lobbyists" in the D.C. area -- counting the 50,000 new Amazon employees, their spouses, parents, children, friends, neighbors, fellow church members, and so on. The local population will have a strong, vested interest to see Amazon do well, and it'd only help in influencing government decision makers. And, once Amazon achieves its takeover of the federal government, USA will now stand for the "United States of Amazon."